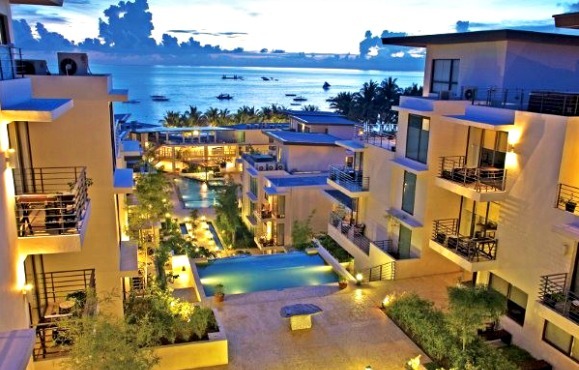 A decade of “Service That’s All Heart” for Discovery Shores Boracay, a luxury resort in Boracay. It was ten years ago when Discovery Shores Boracay opened its doors along the island destination’s famous Boracay white beach. The luxury resort in Boracay soon became the benchmark for tropical hospitality with its exceptional facilities that include 88 contemporary and well–appointed suites, outstanding food and beverage outlets and a highly personalized guest culture that has earned for it high marks as well as international acclaim such as No. 1 Hotel Spa and No.1 Hotels for Families in the World’s Best Awards by Travel + Leisure magazine. A gathering of top Discovery executives led by The Discovery Leisure Company, Inc. Chief Operating Officer Jun Parreno and Discovery Shores Hotel Manager Erwin Lopez welcomed VIP guests that included pioneer employees, travel industry partners, repeat guests, Boracay hoteliers and media personalities on the first night of festivities. The event kicked off with a fun and high-spirited display of Discovery friendliness and spontaneity as the resort staff paraded and danced their way into the party venue accompanied by lively island music. A highlight of the evening was when the 18 pioneer employees who were part of the Discovery Shores team pre-opening team were honored with a surprise trip to Osaka, Japan. Adding a sense of nostalgia was the presentation of a video montage showing the unforgettable moments of the men and women who have built lives, careers, friendships in Discovery Shores through the years. Like their eagerly awaited New Year’s Eve parties, Discovery Shores lit the evening sky with a grand fireworks display. The crowd cheered as they watched the burst of light and colors accompanied by the lively beats courtesy of club favorite DJ Ron Poe. It was a grand and memorable way to cap the first night of this 2-day celebration. Day 2 of the festivities was the time to recognize the contribution of travel industry partners. On a cool, moon-lit evening, Discovery Shores’ Director of Sales Mark Ranada honored their top producers with an outdoor dinner featuring dishes from the resort’s soon-to-open Forno Osteria at Estate XI. Then it was on to the awarding ceremony where every valued partner was presented with a true work of art - individual brass and glass trophies by artist Ferdinand Cacnio depicting a woman with her hand pressed to her heart, echoing the gesture and service philosophy of the Discovery group - “Service That’s All Heart.” Aside from recognition and tokens of genuine appreciation from Discovery Shores, the Top Producers were showered with additional gifts from event partners Discovery Primea, Discovery Suites, Banana Republic, Beach Hut, Oster, The Foreign Post and Corporate International Travel and Tours.